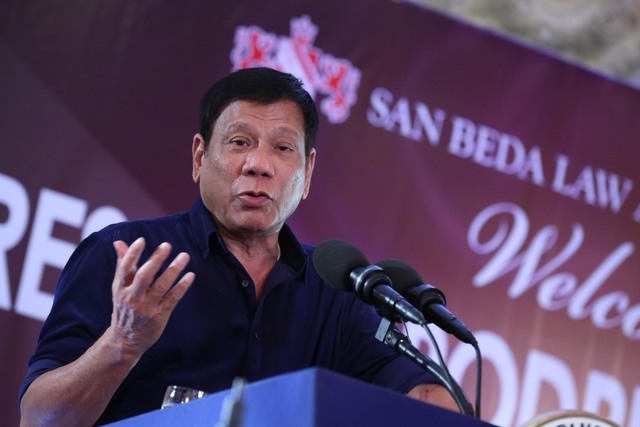 MANILA, Philippines: Nearly all Filipinos trust President Rodrigo Duterte as he embarked on his term, according to the results of a Pulse Asia Research, Incorporated survey released on Wednesday, July 20. The results of the nationwide survey conducted among 1,200 Filipinos from July 2 to 8, showed that 91% of Filipinos trust Duterte, while less than half a percent distrust him, and 8% are undecided on whether or not to trust him. “President Rodrigo R. Duterte begins his stint as the country’s 16th president with an overwhelming majority of his constituents expressing trust in him (91%) and practically no one distrusting him (0.2%). The rest of Filipinos (8%) cannot say if they trust or distrust President Duterte,” Pulse Asia president Ronald Holmes said. Former president Benigno Aquino III used to hold the record of the highest level of public trust in the Pulse Asia trust survey first conducted in 1999. 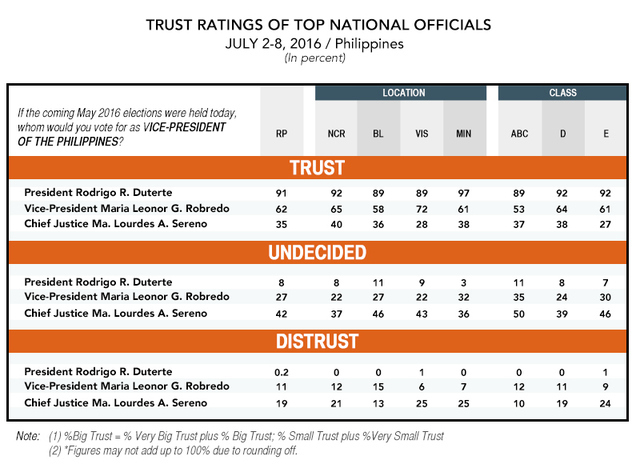 In a survey held during a similar period in Aquino's term – July 1 to 11, 2010 – Aquino had a trust rating of 85%. Among geographical locations, Duterte earned the highest trust rating in his bailiwick, Mindanao (97%). Among socioeconomic classes, trust for Duterte is highest among Class D and the poorest Class D, both at 92%. “This expression of confidence, therefore, shall serve as an inspiration to the Duterte administration to continuously make a real difference and make our people’s lives better, safer, and healthier,” Andanar said. The survey results also showed that 62% of Filipinos – a “sizeable majority,” according to Holmes – trust the Vice President, while 11% distrust her, and 27% are undecided on whether or not to trust her. 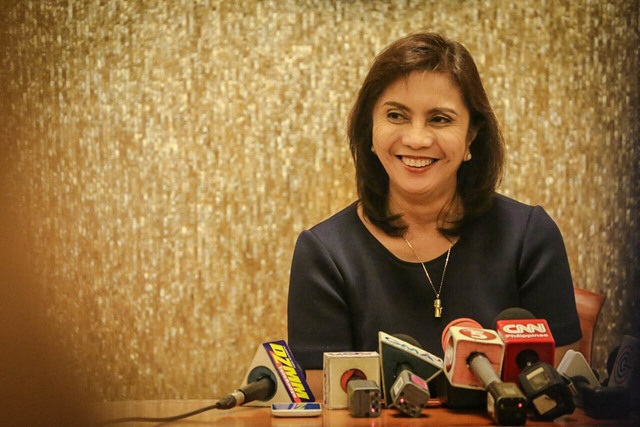 “Most Filipinos – regardless of geographic location and socioeconomic status – say they trust Vice-President Robredo (58% to 72% and 53% to 64%, respectively),” Holmes said. Among geographical areas, Robredo got her highest trust rating from the Visayas (72%), and among socioeconomic classes, from Class D (64%). Indecision on whether to trust the Vice President is highest in Mindanao (32%) and among the well-off class ABC (35%). Robredo thanked her countrymen for the overwhelming "vote of confidence." "We are overwhelmed by the outpouring of support from our fellow Filipinos. From 1% in the pre-election surveys to 35.1% – and now, a trust rating of 62%," she said in a statement. The survey showed that the primary sentiment toward the Chief Justice is one of indecision, as 42% of Filipinos are undecided on whether or not to trust her. But there are more Filipinos who trust Sereno than distrust her (35% vs 19%). “Big plurality indecision figures are posted by the Supreme Court Chief Justice in the Visayas (43%) and Class E (46%). On the other hand, the latter receives practically the same trust and indecision ratings in Metro Manila (40% versus 37%), the rest of Luzon (36% versus 46%), Mindanao (38% versus 36%), Class ABC (37% versus 50%), and Class D (38% versus 39%),” Holmes said. During and immediately before the survey period, among the major news were the oath-taking of Duterte and Robredo, Cabinet appointments including Robredo as housing chief, cases filed against Aquino in connection with the Disbursement Acceleration Program and the Mamasapano clash, and the spate of drug-related killings in the country and calls to probe these. Around this time, Duterte also expressed his willingness to have bilateral talks and joint exploration with China in the West Philippine Sea (South China Sea), Holmes said. The nationwide survey has a ± 3% error margin at the 95% confidence level; subnational estimates for each of the geographic areas covered in the survey (i.e., Metro Manila, the rest of Luzon, Visayas and Mindanao) have a ± 6% error margin, also at 95% confidence level.